Follow our photo tour of Terra Folia Rainforest Preserve and La Ronda Organic Farm. Below read the captions for all the photographs included in the web site. Click on the thumbnail to see the larger version. Enjoy! Trails through the forest are often dense and not easily navigable. In the rainy season, standing water accumulates. 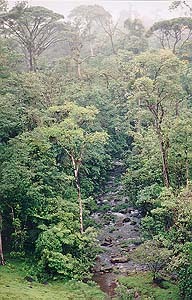 Many large rainforest trees have thick buttressed bases, since shallow, tropical soils prevent deep roots. This rainforest tree at Terra Folia has a Strangler fig attached which eventually will consume its host and grow very large. "Posito," one of our favorite swimming holes at Terra Folia, is located near an old prison trail in Devils Canyon, so-named for its dense forest and rugged terrain. The Lipstick plant (Rubiaceae family), or "Lover's Lips," is a unique plant found at Terra Folia. The Stained-Glass Window palm (Geonoma epetiolata) is a CITES-listed endangered species. This plant occurs only at Terra Folia and its immediate surroundings. The lovely "rana venenosa" or "bluejeans frog" (Dendrobates pumilio), is one of many species of Poison-dart frogs which are native to tropical rainforests. This particular species is very common at Terra Folia, especially after it rains. A breathtaking view of the Tiger River. A view of Arenal volcano, one of the world's most active, located just three hours north of the capital city San Jose. 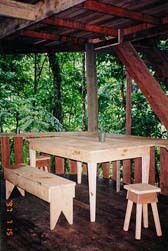 An outside an interior view of our new Monkey HouseTM rainforest cabins. "Catarata", a magnificent large waterfall an hour and a half walk from Terra Folia. Bonnie and Jill give dad a hug at the front door of their home at La Ronda. In the barn at La Ronda, Jill grooms "Chispa" and new daughter "Filly". Hachiko Ueno, veteran of the Costa Rican rainforest, is one of three Akitas in the Chatham family. Here he is in Braulio Carrillo National Park near La Ronda. The Chatham family -- Bonnie Marie, Rick, Anna Barbara, Maricela, Richard, and Jill Shannon -- at Rio San Rafael near Terra Folia. Rick and Maricela near Arenal Volcano where their family often visits. Cross-section of mature forest along Gaucimo River. Poachers removed this tree illegally from our property at Terra Folia. Another shot of the giant taken from our rainforest illegally. 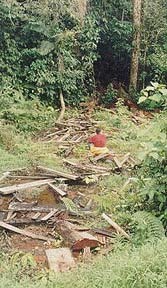 A trail of damage and destruction left on Terra Folia from the illegal log harvesters.